Day one of the race on Saturday, October 27, 2018, at Lake Michigan, saw sailors greeted by cool fall temperatures, however, midway through the afternoon, the wind began to shift to the north and lighten with the committee managing to complete a total of 8 races before calling it a day. On day two, cool temperatures persisted and lots of rain but overall it was a cool weekend with light, shifty winds for the most part until the last two races when a shift to the west provided a solid 12-15knts of breeze to end the regatta. 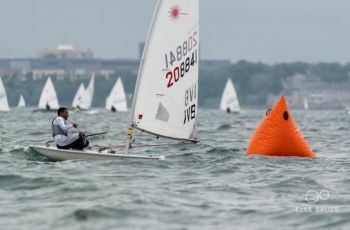 The ISSA congratulated all the sailors saying, “it was great to see and hear all the good sportsmanship," from competitors, coaches and spectators. Coming in first was Collin Porter of Savannah Country Day School and Caden Scheiblauer of Santa Barbara High School in second to end the championship. Mr. Lettsome! Congratulations! You’re give it your best. Better luck next time. We need to give more encouragement to those who’s actually doing positive and trying their best to make positive decisions etc. Congratulations Thad, You did Great. From Your East End Family Community. As expected you always do well in everything you do. I know your parents, Gayle and Ashbel must be so proud of you. Gayle and Ashbel's son is CHAD Lettsome and a grown man. The sailor is also from the a East End community but he is THAD, a youth and no immediate relation to Chad. Ashbel's and Gayle are not the parents of Thad Lettsome.